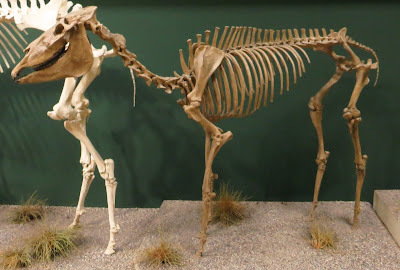 Mounted skeleton of Pliohippus in the Natural History Museum, Karlsruhe, copyright Ghedoghedo. The Equinae are a group of horses in which the lateral toes are reduced and non-functional, or lost entirely (Churcher & Richardson 1978). Characters (from Churcher & Richardson 1978): Skull with postorbital bar. Upper incisors with more or less developed infundibula; in later forms on some or all lower incisors also. Cheek teeth hypsodont, crown height equal to or greater than mesiodistal diameter; cementum in fossettes and in later forms over all of crown; small enamel folds or plis present on lophs, often numerous. Premolars 2 to 4 fully molarised; P1s small or absent. Upper molars with protolophs and metalophs joining ectolophs even in early stages of wear; premolars with transverse lophs potentially remaining free until late stage of wear; fossettes usually closing with wear. Protocone separate or nearly detached from protoloph; elongate, with major diameter oriented mesiodistally. Lower molars with pattern composed of two crescentic lophids joined in middle of tooth; metaconid and metastylid completely fused, mesiodistally elongated, forming double loop in later forms. Ulna greatly reduced in shaft, sometimes incomplete, usually fused to radius. Metapodial III and phalanges relatively elongated; lateral metapodials and digits narrowed, moved posteriorly to limb axis; distal ends of metapodials bent posteriorly. Lateral hoofed phalanges laterally compressed, not extending to plantar surface of III; in latest forms lateral phalanges lost, lateral metapodials reduced to splint bones.